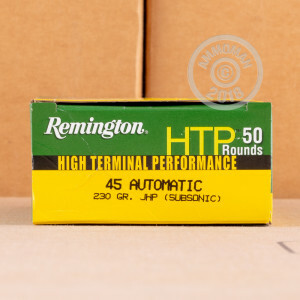 This Remington HTP ammunition in .45 ACP is an excellent self-defense load for 1911s or other .45 Auto pistols. It fires a heavy 230 grain jacketed hollow point bullet at a subsonic muzzle velocity of 835 feet per second. 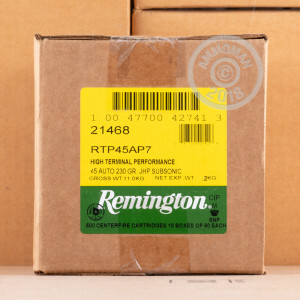 Assembled in Lonoke, Arkansas, Remington HTP ammo delivers an effective self-defense option at a reasonable price suitable for range use. This case of 500 rounds contains 10 convenient 50-round boxes. 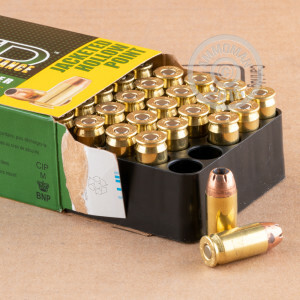 Like other HTP ammo, these cartridges use non-corrosive Boxer primers and brass cases. AmmoMan.com offers free shipping on all orders over $99, making 500 and 1,000 round cases a spectacular deal!